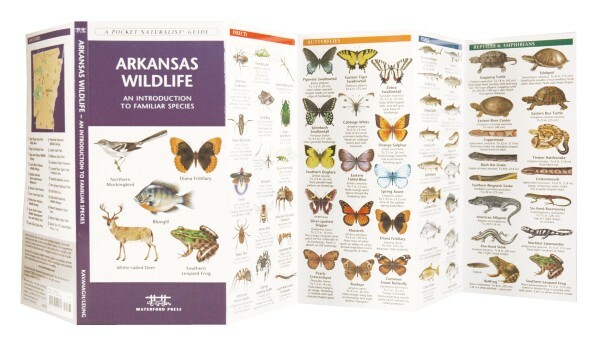 Arkansas Wildlife, An Introduction to Familiar Species, is a beautifully illustrated guide from Waterford Press that highlights over 140 familiar species of birds, mammals, reptiles, amphibians, butterflies/insects, and fishes. 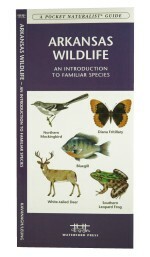 Arkansas Wildlife is the perfect pocket-sized, folding guide for the nature enthusiast. This beautifully illustrated guide highlights over 140 familiar species of birds, mammals, reptiles, amphibians, butterflies/insects, and fishes and includes a map featuring prominent state-wide wildlife sanctuaries. Laminated for durability, this handy Pocket Naturalist Guide from Waterford Press is a great source of portable information and ideal for field use by novices and experts alike.